You have worked many months to complete your thesis or academic paper and you have relied on existing knowledge to finalize your research. Now you want to make your work available to the public. Here is how to properly include your academic research (journal article, thesis, book, ) in the Google Scholar search engine. First, you want to create a Google Scholar profile. Go to scholar.google.com and in the top, choose ‘my citations‘ ( ). If you were not yet logged in into your Google account, you will have to do so now. From this page, you can create your Google Scholar profile page. Include as much information as possible, such as a profile picture, your website, affiliation and areas of interest. I would also recommend you to make your profile public. Go to this page to start adding a document manually. Choose the type of document (journal, conference, chapter, book, thesis, patent, court case or other). Fill in all the details about your article (title, author(s), publication date(s), volume, publisher, institution). Click save and if you filled in everything correctly, you will see the message ‘Added article to your profile’. Congratulations! In case you have an academic career and you have a list of work on your (academic or personal) website, option 2 is more suitable for you. Go to this page and pick the type of website you are submitting. In my case, I choose ‘Personal publications’. Read and check the check-boxes that apply to you, such as ‘My inclusion request is for my personal publications’. Fill in the requested details, whereby the your webpage with academic articles should be filled in by ‘List of publications page’. Lastly, you are asked to include one or more article examples. So, paste the direct link to on or more of your PDFs there. Thanks for submitting your website to Google Scholar. Our crawl team is working hard to add new content as quickly as possible, and we appreciate your assistance. Please keep in mind that bibliographic data is extracted from your pages by automatic software. If you aren’t satisfied with the accuracy of your listings, please refer to our technical guidelines at http://scholar.google.com/intl/en/scholar/inclusion.html for ways to provide more accurate bibliographic data. If your content meets our guidelines, you can generally expect to find it included within the Google Scholar results within 4-6 weeks. Be patient, because as the message says, it can take up to a month or more before your articles are indexed. You will also receive an e-mail from [email protected] with the data you just submitted. Here is a great tip: follow your own Google Scholar profile! Go to your own profile and at the top right, choose ‘follow’. Enter your e-mail and create the alert. 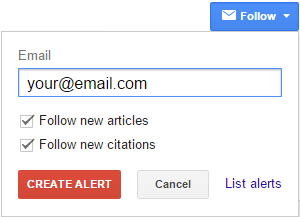 If Google adds a new article to your profile, or a new citation, you will receive an e-mail alert. This is an excellent way to receive a heads up if another researcher or student has cited your work in their academic writings. Maybe you can even reach out to the author(s) and talk about their research; a great way to expand your network. What are good open alternatives or extensions for Google Scholar and Microsoft Academic Search? Mate is it equivalent to journal publishings. Thanks a lot Mr. Thomas. I am much benefited by your informative article. The way and simplicity gave me enourament to read all and actually helped me to solve my problem. God bless you. Thanks Thomas for the link to “Submit a website with all your work”, that was a great tip. how to add pdf file to google scholars? Many scholars, economists, and other professions consider 2007- 2009 global financial crisis as the worst financial crisis ever since the great depression of 1930. The period characterized by the collapse of many financial institutions, massive bailouts, the economic downturn and finally the great recession was primarily attributed to the failure of corporate governance. As much as this was a low point in corporate governance, it also showed its importance not only to individual firms but to the world economy as a whole (Tricker & Tricker 2015). Never before has the notion that corporate boards and institutional investors are the most important corporate governance mechanisms in the firms with important implications for the sustainable long-term success of the firm been so vividly seen. From time immemorial as humans, we have always learned from our mistakes and the 2007-2009 was an eye opener especially to corporate governance. Before I can explain further on the notion, it is important to learn the basic aspects of corporate governance. Corporate governance in simple terms refers to the set of rules, processes, and practice through which a company is controlled and directed with (Solomon 2007). It involves balancing the interests of the organization with the interests of other parties such as the government, investors, lenders, suppliers, the community etc. When executed properly, corporate governance can help a company avoid certain risks such as lawsuits, fraud, and misappropriation of funds. In addition to that, good corporate governance helps in boosting the organization’s brand and reputation to the media, investors, suppliers, customers and the society as the whole. Furthermore, cooperate governance protects the financial interests of the individuals involved with the company such as the shareholders and the employees as explained by (Vitez, 2017). Corporate governance can be defined in many ways but when it comes to analyzing it, we do it through a framework of different theories. One of those theories is the agency theory which looks at the shareholders as the principals and the executives that have been hired to run the business as their agents. Another theory is the stewardship theory which looks at the executive as the stewards of the shareholders with both parties sharing the same goals. In addition to that, we have the resource dependent theory which considers the board as to be in existence so as to provide resources to the management with the aim of achieving the overall objectives of the business. Stakeholder theory comes from the assumptions that it is not just the shareholders who have an interest in the company but other parties too such as suppliers, the government, creditors among others (Farrar 2008). This means that this parties too can be affected by the success or failure of the business. Other theories of cooperate governance include transaction cost theory, political theory, and ethical related theories. The code of governance over the years have originated for various reasons or in response to various circumstances. The first major release was in 1992 by Sir Adrian Cadbury popularly referred to ‘Cadbury Code’ titled “the Financial Aspects of Corporate Governance”. Following serious revisions over the years, the code is nowadays administered by the Financial Reporting Council. The Organization for Economic Co-operation and Development (OECD) developed the first internationally influential codes back in 1999 following a business advisory committee that was led by Irra Milstein. Boards that govern companies are influenced by several documents which include but not limited to articles of incorporation, by-laws, corporate governance guidelines, committee charters, and codes of conduct. When it comes to the United States, various federals laws such as the Sarbanes-Oxley Act of 2002, the Dodd-Frank Wall Street Reform and Consumer Act, federal laws as well as federal security laws in addition to regulations, rules, and guidance from SEC are used. These documents are meant to be used for the purpose of best practices and flexible working standards to safeguard the various parties that have an interest in the organization. In short, they basically outline the interaction between the board and management outlining the structure and the behavior of the board. The codes are normally contributed to by various individuals including investors, accounting firms, regulators, banks, corporate governance interest organizations, academics, and stock exchanges, among others. Policies, control, and guidelines are vital for an adequate corporate governance mechanisms. An effective corporate governance mechanism will consist of a number of various mechanisms. The first level consists of internal mechanisms which monitor the business from within and take corrective measures when the business stray away from its set objectives. They include reporting lines that are clearly defined, systems that measure performance and systems for the smooth operation of the business. The next level is the external mechanisms which are controlled by those outside the business and serve the objectives of outsiders such as the regulators, government, financial institutions, and trade unions among others. The objectives of the external mechanism include proper debt management and legal compliance by the company in question. The last level consists of an audit of the entity’s financial statements by an independent auditor who generally works to serve both the internal and external parties that are involved with an organization to ensure that their interests are guided and that the management is doing everything properly. They also act as a second opinion to back up what the management is saying. The board generally consist of groups of individuals elected or nominated by shareholders in the annual general meeting. The board of directors normally act as a bridge between the company and the shareholders -it decides as a fiduciary with the aim of protecting the latter’s interests. This is the norm with a Public company even though nowadays most non-profit making organizations and private companies also have a board. Their main mandate is to make policies for corporate management and also to make decisions on major issues that affect the company. Shareholders. The duties are regulated by the statutory laws, federal statutory laws, listing standards, common law and shareholder activism and litigation. The membership of the board normally constitutes independent directors, senior company executives, non-independent directors such as former senior executives of the company among others. Nasdaq rules require the majority of the board members to be independent and in they constitute up to 75% or more of the boards in 93 of the top 100 US companies. Most boards consist of 8 to 15 members. There are no age and nationality restrictions although in recent years gender balance has been emphasized. The board’s primary role as discussed earlier is the fiduciary duty to safeguard the finances and the legal requirements of the entity. They do this by ensuring that the entity in questions does all that is required of it by the law, and the funds are properly used. Another role of the board of directors is setting up the mission and vision of the organization. In addition to that, they ensure that the management adheres and work towards achieving them. Over sighting the activities of members of the organization such as executives is another role of the corporate board. The board ensures that the management adheres to rules and regulations and do their work as prescribed. Other roles of the board of directors come up in the annual meetings where-by, they announce the annual dividends, oversee the appointment of key executives and amend the by-laws where it is necessary (Dimopoulos & Wagner, 2016). Other roles of the corporate board include setting up the strategy for the company for long-term survival, short-term gains and future exploration of opportunities that are likely to arise. This might also include setting up the structure of the company to ensure efficiency. The board, however, does not take part in the day to day running of the organization and thus serve another role of delegating the duties to the management. The board should also monitor, control functions and set up compensation plans for the executives. Last but definitely not least, the board helps in acquiring resources for the organization while ensuring continuity. With great power comes great responsibilities. The board must always use their powers for the right reason and do what is required of them by the shareholders of the company. The board must always carry out whatever they do in the full interest of the company, and in case there is a conflict of interest then the interests of the company should always come first. They must also carry out their task with due care minding the interests of both the shareholders and that of the employees. Other responsibilities of the board include acting as the court of appeal in case there are disputes, accessing the performance of the firm and enhancing the organization’s overall public image and brand name. An institutional investor is a person, persons or organization that pools money or provides funds to purchase securities, other investment assets, property or originate loans. They include financial institutions such as banks, Insurance companies, pension and hedge firms, investment advisors, commercial trusts and mutual funds. For a firm to grow, it requires resources inform of money which is provided by these institutional investors who get profits and interests as compensation for their troubles in taking the risk. The returns should exceed the fees and expenses of the investments and is compared against treasury bills which are considered to be risk-free. The institutional investors can act as a source of stability in hard times as was the case in the coal crisis in India recently. By offering additional funds, the institutional investors increase their stake and say in the company thus can push for better corporate governance. Another aspect related to this is the fact the institutional investors have a louder voice compared to minority investors. Most of the time when minority shareholders raise their concerns on corporate governance, they will rarely get addressed or at times get thwarted by the minorities which are not the case with institutional investors. Other parties that are involved in corporate governance include the shareholders themselves who have the biggest interests as the main contributors of capital, the employees who get their incomes and job security from the good governance of the company, the government which gets taxes from the organization and the society as a whole which benefits from job creation, income distribution, corporate social responsibility activities of the firm among other benefits. The story of Enron was not only the largest bankruptcy case at the time but also the biggest audit failure. This was cited by many as the biggest corporate governance failure especially on the part of corporate boards and institutional investors. Enron was founded in 1985 by Kenneth Lay who also triples up as the chairman and chief executive officer. This was after merging Houston Natural gas and Intermonth. Other key people involved with Enron included: Jeffrey Skiing who was the C.O.O, Andrew Fastow who was the CFO and Rebecca Mark-Jusbasche who was the once a vice chairman. From 1995 to 2000 Enron was in fact named America most innovative company by Fortune. In the mid-2000s at its peak, the shares of Enron were trading at $90.75 per share. By the end of November 2001, they were trading at less than $1 per share. This was when the shareholders filed a $40 billion lawsuit. Enron filed for bankruptcy on December second, 2001 with assets worth $63.4 billion making it the biggest bankruptcy scandal ever in American history at the time. At this stage, the shares were going at $0.26 per share. Lack of due care and skill from the board was one of the reasons why Enron failed. As submitted by S.Watkins, Kenneth Lay who was Enron’s chair, could not get what was being said to him in regards to the company having questionable accounting practices. This also showed lack of proper communication between the board and the executives. This was further elaborated by Jeffrey McMahon, the new Enron’s president who said it was virtually impossible to challenge the authorities at Enron. A culture of intimidation had also developed at the company with the likes of Ms. Watkins fearing to lose their jobs. The board literally failed in its role of directing. This showed some sort of conflict of interests where they were more than happy to receive high compensations without asking serious questions which would have led to a decrease in their personal bonuses. The management who carried out the day to running of the Enron misrepresented information by allocating Enron’s debts to its dubious partners. This also showed the lack of proper internal controls at Enron (Carberry & Zajac 2017, p.15134). The corporate investors also failed to properly supervise the company and advice accordingly. For example, according to an economist at Enron, it was important it was all mind games as it was important for the employees, investors, and analysts to believe that the stock will bounce back. Other corporate investors such as the two trustees of Enron’s 401(k) plan failed in their duties as they did not warn the plan participants despite a memo detailing the accounting malpractices. The institutional investors also had all the knowledge and expertise but failed to utilize them- they just sat back and believed whatever they were told. Reckitt Benckiser is a British multinational that produces consumer goods to do with hygien, health, and home products. The name comes from the merging of a United Kingdom company Reckitt & Coleman and Benckiser NV that was based in the Netherlands back in 1999. The most well-known products worldwide include Dettol and Strepsil. Reckitt Benckiser acquired Korean Oxy brand in 2001 which had been using polyhexamethathylene guanidine (PHMG) in a product since 1996. In 2011, PHMG was banned by the Korea Centers for Disease Control and prevention after a published report showed a link to lung damage and report. Several reports also came out supporting the Korean report, and at the height of this in 2016 a coalition of consumer groups came out for the total boycott of Reckitt Benckiser products after it had been linked to more than 500 deaths from a BBC report. In the case of corporate governance, the management and directors fail as a whole in doing their duty of due care and skill when acquiring the Korean Oxy brand. They had a duty to investigate and know what is in the product. They put the company’s financial interests before the safety of the consumers. In addition to that, several attempts were made by the board and management to suppress investigations instead of taking corrective measures. Even though this was mostly a failure by the management and board, institutional investors also had the power to ask questions. Despite the various reports, they were silent till there was outrage in the mass media. Satyam was India’s fourth largest computer service company in India which has a population of over 1 billion. It was even listed on New York Stock exchange in 2001 with revenues exceeding $1 billion. The founder, M. Raju Ramalinga who was also the chair was a highly regarded person in the business often gracing all the major corporate events. In 2008 Satyam won the coveted prize of the Golden Peacock Award for compliance issues and Risk Management in corporate governance. In 2009, M. Raju confessed that the company’s accounts had been falsified by a massive $1.47 billion (Bhasin 2005). In the same year, Satyam stock was banned from trading on the New York Stock Exchange, and the Golden Peacock Award stripped off. Mr. Raju was later convicted together with other senior members. The board at Satyam failed in their primary duty of due care and monitoring the activity of the business as they did not notice the discrepancy. This was so evident that the first order was to appoint a temporary board. The board also put their interests first at the expense of the company for financial gains as confessed by their chairman. Despite the amount that falsified being that large, the auditors who were Price Water House Coopers failed in their auditing duties as they did not report anything amiss despite having all the expertise and experience. They were even fined $6 million by the US stock exchange for not following the code of conduct and auditing standards in when offering their services to Satyam. Institutional investors also failed to raise questions or properly examine the financial statements. Furthermore, with their expertise, they should have pushed for compliance with the corporate code of governance. Before filing for bankruptcy protection in 2002, WorldCom was the second largest long distance phone company in the United States. With assets totaling over $104 billion, $30 billion in revenues and over 60,000 employees WorldCom filed for bankruptcy protection on July 1, 2002. The company later wrote down more than 75% of the total assets with over 17,000 of the workers losing their jobs. Over the period between 1999-2002, WorldCom had deliberately overstated their income before tax by over $7 billion which was the main reason behind the falling from grace to grass. It is currently known as Verizon business or Verizon enterprise solution after being acquired by Verizon Communications and is slowly rebuilding and being integrated into the parent company. The biggest failure of WorldCom was the fact that the board had failed in its structuring role. Over the years, it had acquired a lot of companies with even one accountant confessing that they would get calls from people they did not even know existed. The departments were also not even properly structured for efficient working and were very decentralized. For example, the finance department was in Mississippi; the network operations were in Texas, the human resource in Florida and the legal department in Washington DC. This provided a challenge of communication as each department developed their ways of doing things. Apart from that, the difference in management style and the culture that was developed of not questioning seniors was a discouragement for employees who wanted to correct any issues that arose. In fact, there was a deliberate attempt by the management to hide vital financial issues as explained by Buddy Yates, the director of general accounting who was told he would be thrown outside the window in case he had shown the numbers to the auditors by Gene Morse, a senior manager. The employees also put their self-interests above the interest of the company as loyal employees were often compensated above the company’s approved salaries and bonus packages by Ebbers and Sullivan. The biggest failure was the board however as they failed terribly in all their roles and responsibilities including due care, supervision, bridging the gap between management and shareholder among others. In the case of institutional investors, they also failed terribly. No one raised a question on the structure of the firm or why the firm was highly decentralized. The increase in the salaries and compensation for the ‘loyal’ employees in the finance and accounting department should also have raised questions. Institutional investors should have also used their expertise to confirm the information that was being provided to them. Division of Responsibilities: The duties and responsibilities of a firm should be properly defined and allocated within an organization. This will help in reducing conflicts and also knowing who is liable and for what. This will also help enhance effective communication within an organization. Stronger Internal Controls: Controls in an organization should start from within for effective corporate governance. The controls include the supervision of seniors, physical controls, controls among others. Proper training of directors: The directors of the company are the eyes of the society and shareholders in the business. They need to be properly trained to carry out their tasks effectively as is required of them. Another option is to select a board of directors that is highly qualified in the different fields that the business is engaged in. It is crystal clear from the discussions above that the corporate governance mechanisms such as corporate boards and institutional boards are the backbone for the survival of any company. From the cases discussed above, we can see the consequences of bad corporate governance and the fact that it does not matter how big the company is. In addition to that, there is a failure the many bodies that are meant to supervise corporate governance. Corporate governance board needs to do more than just take the words of corporations. It is an understatement to say that corporate governance should be a priority, it should actually be a prerequisite (Lebedeva et al 2016). Bhasin, M.L., 2015. Corporate accounting fraud: A case study of Satyam Computers Limited. Christensen, J., Kent, P., Routledge, J. and Stewart, J., 2015. Do corporate governance recommendations improve the performance and accountability of small listed companies?. Accounting & Finance, 55(1), pp.133-164. Dimopoulos, T. and Wagner, H.F., 2016. Corporate Governance and CEO Turnover Decisions. Gillan, S.L. and Starks, L.T., 2000. Corporate governance proposals and shareholder activism: The role of institutional investors. Journal of financial Economics, 57(2), pp.275-305. Klapper, L.F. and Love, I., 2004. Corporate governance, investor protection, and performance in emerging markets. Journal of corporate Finance, 10(5), pp.703-728. Lebedeva, T.E., Akhmetshin, E.M., Dzagoyeva, M.R., Kobersy, I.S. and Ikoev, S.K., 2016. Corporate governance issues and control in conditions of unstable capital risk. International Journal of Economics and Financial Issues, 6(1S). Solomon, J., 2007. Corporate governance and accountability. John Wiley & Sons. Tricker, R.B. and Tricker, R.I., 2015. Corporate governance: Principles, policies, and practices. Oxford University Press, USA. we are submitting it to google scholar manually already for one year, but it is not indexed still in scholar. hello, how to upload my thesis into google or share .